A dependable option for repeat cycle timing. Switch closure time within the cycle can be as low as 1% to a maximum of 10% of the cycle time. SPST or SPDT switching available. Contact Midwest Timer Service today for more information. M175: 15 amp 125 VAC, 1/2 HP 125/250 VAC. 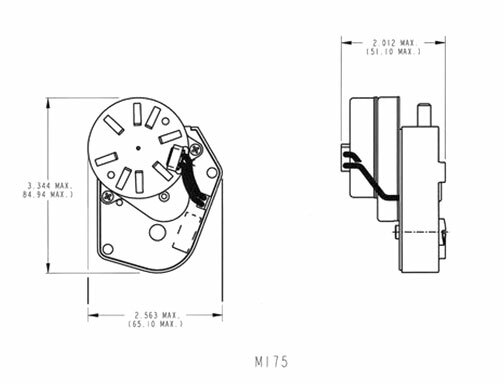 M177: 15 amp 125 VAC, 3/4 HP, 125/250 VAC. .250" (6.35) x .032" (.81) male spade with fold over construction. Termination designed to accept a standard one piece terminal plug for quick plug-on wiring. Permanent magnet, 24 VAC, 115 VAC or 230 VAC nominal voltage inputs at 50 Hz, 60 Hz or 50/60 Hz. Clockwise. One way ratchet clutch. Semi-flush with tapered surface for one way manual setting for system checks. Plastic 500" (12.7) long knurled knob also available. .Two .127" (3.23) diameter holes to accept #6 self-tapping, thread-cutting screws or two .187" ( 4.75) through-holes.